From time to time, I score a really great piece for an even unbelievable price at the Gap. Those times that I randomly decide to go in, never disappoints. This blouse has a soft houndstooth print throughout (which i love) and a pocket and color trim which give it a pajama top vibe. I don't usually find that pajama look appealing, but for some reason I was drawn to this. Vegas was busy... with lots of walking and browsing, which is basically one of the top things on my list of favorite things to do. As long as plans stay intact, I will be going to Palm Springs with family for some bonding, relaxing, and soaking in mineral water. And knowing my aunts, we will be stopping by the outlets. No doubt. Awesome outfit! You look so glamour and chic! 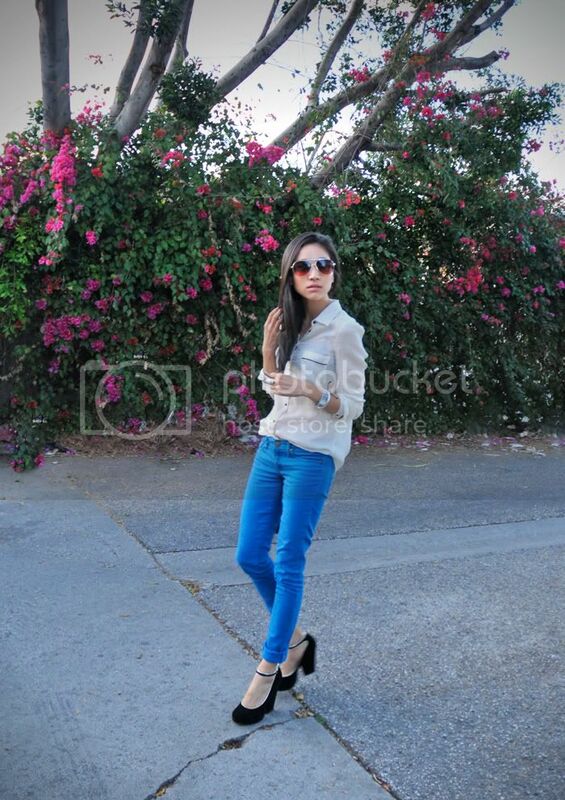 Great combo electric blue jeans, white shirt and amazing shoes! This outfit is the perfect illustration of effortless chic for spring. A pop of color and a breezy, gauzy top with character. You look so perfect, I wanna hurl (I mean that in a good way).